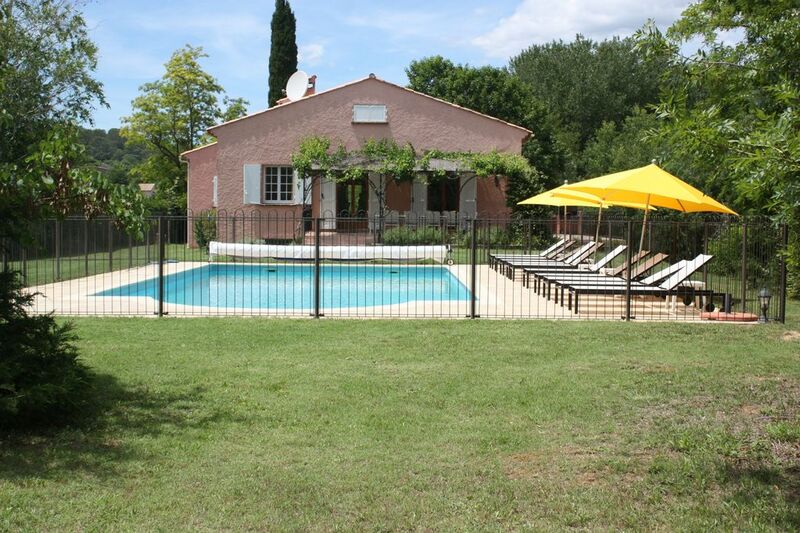 A spacious villa in Provence, near Lorgues, with large heated pool. The villa is situated in the heart of the Var's wine growing region, lying in a calm and peaceful area, surrounded by vines and trees. It is the perfect get away for relaxation and yet only a few minutes from all necessary amenities. The villa has most of the living space on one level. The interior is regularly repainted and updated. The tiled kitchen opens onto the dining and salon which leads onto the terrace and pool (12m x 6m). The living area is comfortably furnished with a fire place, T.V., DVD, sofas and chairs. The 2 acre mature garden is surrounded by high hedges and is fenced off from the river at the bottom of the garden. Nearest neighbours are about 80m from our hedge. This is a great holiday home for families, either several generations of one family or two families. There is loads of space in the villa and gardens to have fun & games together or to get away for those moments of peace and privacy. Both bathrooms have baths with hand showers, additional large separate shower 'rooms', toilets and basins. The ensuite bathroom has 2 basins. The ensuiute shower room also has a basin. There is a seperate toilet. The landline telephone is availble and any costs will be deducted from the breakages deposit at the end of the stay. Central heating is provided when needed e.g spring and autumn, otherwise there is hot water all the time. There is a washing machine in the basement. There is one useable fireplace in the living room for wood fires. Plently of parking in the driveway. Under the villa - perfect for keeping the car cool in the summer. Comfortably fits 2 family size cars. We have wireless internet at the villa, which freely connects to your device. We provide towels for use at the villa. You would need to bring beach towels. In addition to the freezer combined with the fridge, there is a seperate freezer next to the kitchen to ensure you have plenty of ice in the sumer heat. A selection of dry herbs, salt, pepper, sugar and other bits and pieces are provided in the pantry. There are more than enough plates and bowls for 10 people. Utensils are provided. Its a fully equiped kitchen. This is a fully equiped kitchen, with a fridge freezer, dishwasher, 4 ring hob, toaster, coffee machine, kettle, pots, pans, plates, cutlery etc. There are 2 rectangle glass and iron tables with 12 chairs, which can be either put together to form one long table, or two seperate tables. There is a mixture of books for all ages. There are lots of baby toys. We have about 30 - 40 videos including childrens movies. A large rough garden, giving everyone plently of space. 3 seperate french window doors lead onto a large terrace. Approximately half the terrace is under shade. There is 2 tables and 10 chairs for outside eating. The BBQ is on the terrace. Fenced in. It is a large 12 x 6m pool in a classic roman style with steps leading into the shallow end. The pool is heated in the spring and autumn. 10 sunbeds. For babies and toddlers there’s a changing table, steriliser, plates, cups, cutlery, 2 high chairs, bouncy 'chair' for babies, small soft armchair & moses basket. The large under ground garage comfortably parks 2 cars and keeps them cool in the hot summer months. The terrace off the master bedroom, facing a large expanse of garden, is perfect for relaxing and enjoying the sounds of nature. Access to the second terrace (60m2) is via the 3 glass doors from the salon and dining room. This terrace is the main outdoor eating area (half shaded) with beautiful views over the garden and swimming pool. There's a BBQ unit on the terrace with table and chairs. Since there is so little air pollution in this area you are treated to a stunning display of stars at night as you sip your hot chocolate or finish off a glass of wine. The pool (12x6m) has a safety fence around it. The pool area is fully equipped with 10 sun loungers & umbrellas. You can enjoy a picnic by the river. I rented the villa for a fortnight and it was everything I had hoped it would be, spacious, well equipped and in a lovely position. The pool was huge, as was the garden so the children were not on top of each other. The river at the end of the garden was a beautiful added extra. We found a deep swimming pool after a bit of wading up stream and swam in it every day. My brother in law also brought his inflatable kayak which the children rode the tiny rapids in. The villa was really well equipped, without being chi chi. It is set well back from the road and not near any other property so we felt wonderfully relaxed and remote. However, it is only about an hour from Nice and 10 minutes to Le Thoronet with the butcher and bakery. There were loads of supermarkets close by. We went to the market in Cotignac (amazing) twice and twice rented kayaks at the great place on the road between Carces and Lorgue. A really fun afternoon activity for adults and children. Jonathan (the owner) was so hopeful and reasonable about breakages. He has even posted back to me something I left at the villa. Marceline and Claude, the french couple that help him, were close by and couldn't have been kinder. I definitely intend to rent this villa again. It is a wonderful place, the stuff of childhood memories. The house was ideal for all the family, and there was plenty of room for 10 of us, with lots of equipment etc for babies and toddlers.The location in the vineyard provided peace and quiet in the countryside, yet within easy access of local villages and towns. Dear Gordon, many thanks for your comments, we are glad you had such a nice time at our villa and look forward to having you visit again in the near future. We really enjoyed our two week stay at the villa. It is in a beautiful quiet setting and is an excellent location to explore both Provence and the coast. The villa and gardens were spacious which made it ideal for two families sharing and the pool was fantastic. It was an added bonus to have the trampoline and football goal for the kids as well as the table tennis table which was used by everyone. This is certainly a place to consider returning to. Thank you for taking the time to write the review. We are very happy that you had a successful holiday at our villa and look forward to having you stay again one day. We have just returned from a family holiday in Le Thoronet. The listing description of the villa was accurate and our overall impression was of a clean, well maintained and spacious property. The house was well equipped with everything you could possibly need for young children. The grounds were extensive and the 4 children all enjoyed exploring and playing in them. The pool proved a big hit with children and adults alike. The setting was peaceful and convenient for visits to nearby towns and villages such as Villecroze, Cotignac and Aups and also further afield to St Tropez. We found that all the restaurants we went to were happy to accommodate us (10 people) by putting tables together etc. and one of our favourite places for lunch was St Croix on Lac St. Croix for the fantastic views of the lake. Jonathan and his family were friendly and helpful and I would not hesitate to recommend this property to friends or relatives. Many thanks Jonathan. Thank you for writing the review, it is always appreciated. It was lovely to meet you and we are a very glad you had a great holiday at our villa. Look forward to seeing you again in the future. Had a fantastic one week stay here. It was a great base to explore the Coast and numerous local villages and towns from. Rooms were spacious and well laid out, perfect for two families with small children, but could easily have accommodated more. A vast selection of toys, books and DVDs and a huge enclosed garden to keep the kids amused. Pool was lovely and a great size. We really enjoyed our stay only wish it could have been for longer but would definitely return. Le Thoronet, famous for its Abbey, has restaurants, shops, bike hire and tennis. Canoes and kayaks on the river. Within 20 minutes drive here are several beautiful medieval villages, golf courses, vinyards for wine tasting, olive mills and gastromonic restaurants incuding the well known Chez Bruno. Lorgues, 12km, has a good choice of shops and weekly markets. The beaches of St Raphael, Frejus, St Maxime and St Tropez are within 45 mins, as are the stunning lake St Croix and the Gorge du Verdun. Golf: Barbaroux in Brignoles. (never played here but looks good) 20 - 25 min from our villa. 30 - 40 mins drive. Beauvallon-Grimaud golf club - St.Maxine 00 33 4 94 96 16 98 (I think this one is only 9 holes). Esterel Latitudes golf club. St.Raphael. 00 33 4 94 82 47 88 (nice course 18 hole course). St.Maxine Golf Club 00 33 4 94 49 26 60 ( more challenging course, with some narrow fairways and beautiful views of countryside and coast). Saturday to Saturday. Departures before 10.00 and arrivals from 15.00 onwards. There is a refundable breakages deposit of 800 euros to cover any damages, and will be returned shortly after departure less any charges. If there is a cancellation, funds will only be returned if we get another booking for exactly the same period. For bookings during the winter the heating bill is included.